Headway “The Band” Wraparound Multi-Sensor Pickup System for Viola w/Jack, NEW! •Wraparound Pickup Band for Viola •Easy to Install and Remove, No Alterations to Instrument •Multiple Pickup Sensor Elements, Pre-Equalized Tone •High Output Passive Pickup, No Batteries •Includes Standard 1/4″ Female Input Jack •Viola Not Included •Made in the United Kingdom The Headway Viola Band is an instant-fit pick-up which Velcro’s to itself around the the body of the instrument. It requires no alteration of the instrument itself and generates a strong passive (no batteries required) signal which can usually be plugged straight into a mixing desk or combo amp. The multiple pick-up elements, of the Viola version of The Band, are tuned specifically for Viola and deliver a lively, tailored passive signal. The Band is used equally in folk/rock and classical situations and is a favourite with sound engineers and players alike, as it offers far greater volume levels before feedback, compared to mics. You can avoid being tied down to mic stands and The Band cuts feedback, bowing noise, body noise and excessive treble by acoustic filter. The Viola Band installs quickly and easily with no instrument modifications. The multiple element sensor system has plenty of output, no batteries required. The Viola Band provides a warm, natural tone and smooth response, with surprisingly little damping to acoustic tone. 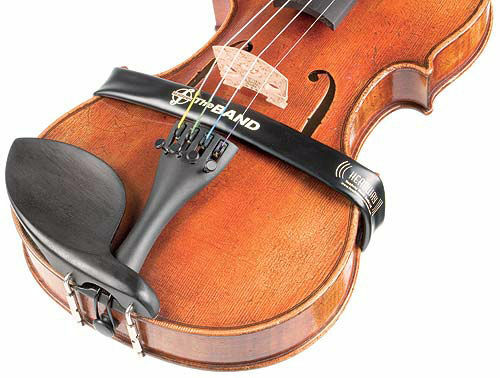 Designed for stage and road use, The Band is easily removed and stores in most viola cases.